Best Steam Press Reviews for 2018. Find your Best Press Iron Here. Do you wish you could get the same crisp clean results with your clothes that you get at the cleaners? Well, you actually can get the same results in much less time and for less money. With your own household steam press, you can smooth your clothes to precision as though they were professionally cared for. Having the best steam press will give you the professional results you desire, so you need to know how to shop for one to get the best value. To avoid ending up with a mediocre machine, we’ve conducted and compiled research on the best models on the market. Use our steam press reviews to find the right machine for your needs. Steam Fast is a brand known for quality and performance in their steam presses. Their SF-680 model is a lightweight tabletop unit that is quick, effective and easy to use, and it’s arguably the best steam press on the market. This digital steam press model features a molded heating element that offers even heat distribution in addition to a non-stick pressing surface that provides a streamlined and professional look as well as reduction of damage to fabrics. The non-stick coated surface of this Steam Fast steam press is 9 to 10 times larger than a standard iron which reduces time significantly. The unit’s precision digital control panel provides control of a variety of dry and steam settings in addition to adjustments for material and temperature. It offers a selection of temperatures, but the model is still much easier to use than many of its competitors. The SF-680 has a water capacity of 10 ounces which offers ample steaming time in addition to its unique dual vaporizing function that reduces moisture build-up. The unit’s steam burst function helps remove tough wrinkles and create long-lasting creases, and it works perfectly for slacks and shirts. The Steam Fast SF-680 is made with a stainless steel construction that provides durability and longevity by resisting rust. It has an automatic shut-off feature to maintain safety and reduce damage to fabrics. It also has a locking handle and alerts when the unit is opened or closed for too long. The unit comes with a 1-year warranty, and the brand maintains a reputation for excellent customer service even after sales. Dual Vaporizing This model features a unique dual vaporizing technology that reduces the moisture of the steam to allow for quicker and drier steaming. Convenience Steam burst buttons are located on both sides of the handle, and it features a wide opening to make inserting and removing items safer and easier. Efficiency The 1350-watt steam press can remove the toughest wrinkles while offering long-lasting creasing and professional results. Appearance The Steam Fast features a professional stainless steel look that also makes the unit rust-proof. Build It’s made with a sturdy build quality, durable construction and impressive performance. Safety Audible alarms and automatic shut-off will engage if the steam press is left closed for 10 seconds or left open for 15 minutes on end. Capability The unit works well even on large items such as sheets. Ease of Use It requires only simple operation while offering fast results. Size & Weight The SF-680 measures 25 x 10.5 inches to make it very similar to its competitors, but it’s one of the lightest high-quality models at only 22 pounds. Storage The bottom plate locks to the top press to allow easy storage and transport. Accessories A filling cup, cushion and spray bottle come included. Singer claims its ESP-2 model can shorten ironing time by as much as 50 to 70 percent over standard ironing. It offers 1,540 watts of power and can generate up to 100 pounds of pressure when steaming. The ESP-2 has up to 14 times the area of a typical handheld iron, and its die-cast aluminum base allows for even pressure and temperature across the device. It provides user control over dry and steam modes as well as temperature control. The unit’s steam burst technology creates concentrated steam with the simple push of a button, and it can create solid creases while also removing tough wrinkles. Users have a selection of no steam or variable steam that can handle a variety of fabrics including nylon and linen. The Singer steam press has a safety shut-off feature that will turn the press off after 15 minutes left open or 10 seconds if the unit is left closed. In addition, the locking handle helps enhance safety while allowing the machine to be carried more easily. The ESP-2 is compact and lightweight to be easily stored and transported. Versatility The temperature is controlled via an easy-to-read panel that provides settings for delicate and durable fabrics. Pressing Area Its large pressing surface is up to 14 times larger than a standard iron. Size & Weight The ESP-2 measures 24 x 9 inches to compete against other top brands. Its aluminum base keeps its weight down to just 22 pounds. Simple Water Filling The water tank is easy to read and fill, and it holds 300 mL of water. Safety This model offers several functions to enhance safety including an audible alarm that sounds when the machine is left closed for over 10 seconds or open for over 15 minutes. It will also turn itself off if left open for this time. Price This is one of the best steam press irons when it comes to value. Despite the fact that it’s made by an established brand, the unit is one of the most affordable presses available. Accessories The ESP-2 comes with a pressing cushion, spray bottle and measuring cup to make steam pressing more convenient. The Sienna Empressa steam press is a great choice for anyone needing a quick and easy alternative to standard ironing. There are many models available with larger-than-average size, and the Empressa is one of those. The pressing area is a remarkable 34 x 12 inches on this Sienna steam press, and according the company, this makes it the largest household steam press on the market with 10 times the pressing area of an iron. The unit weighs 33 pounds and is heavier than many other models, but it can be kept out permanently for those planning to use it on a regular basis. It offers 1,350 watts of power and produces over 100 pounds of even pressure to ensure crisp and long-lasting creases. A fully digital control panel offers much variety to accommodate various fabrics and conditions, and it also works well as a dry press. The steam burst feature provides a quick burst of steam to help combat stubborn wrinkles even better. It also features indicator lights to tell you when the machine has reached the desired temperature and a Steam Ready light to indicate when it’s ready to produce steam bursts. The Empressa is a dependable unit that can quickly remove wrinkles and create creases even in tough fabrics. Size This feature is a favorite in steam press reviews. The pressing area is 34 by 12 inches to allow you to press even larger clothing and linens. It’s the largest household product of its kind in this regard. User Control A digital control panel offers full control and variety. Safety Automatic shut-off engages when the unit is opened or closed for too long. Ease of Use The Empressa is simple enough to operate that it can be used with one hand. Portability It features a locking handle that makes the machine easy to carry. Versatility Multiple dry and steam settings allow use with multiple types of fabric. Non-Stick Coating The Empressa features a non-stick pressing plate and a removable non-stick ironing board cover. The pressing plate reduces build-up of starch, makes cleaning easier and protects delicate fabrics. The Speedy Press steam press features a 1400-watt power source that allows it to generate up to 100 pounds of steam pressure. It uses a fully digital control panel used for setting temperature, and this serves as an enhancement over simple lights or images seen on many other models. The Speedy Press model measures 25.6 x 9.5 inches, so it has dimensions similar to many other presses, but it’s considered lighter by the manufacturer. For it’s size, the 27.5-lb weight may be light compared to other larger heavy-duty units. This model is the best steam press iron when it comes to filling convenience. One of its more impressive features is the fact that the water reservoir is filled from the top. Many users appreciate this as it’s faster and easier than filling it via other methods. This model is simple enough to operate that even those with difficult flexibility can use it without concern. It offers dry pressing as well as steam bursts for more wrinkled items. The sleeve arm is another appreciated feature that is easy to attach and makes pressing much easier. Sleeve Arm The machine’s sleeve arm is a helpful feature that makes pressing simpler and attaches to the unit easily. Powerful The Speedy Press model provides 1,400 watts of power and is capable of generating 100 pounds of pressure when steaming. Steam Ports This unit features 38 ports that create powerful jets of steam to quickly remove wrinkles with little effort. Digital Control Panel Instead of the barely-noticeable indicators of other machines, this model has a complete control panel that offers total flexibility in setting temperature and other characteristics. Easy to Use The unit can be used with no special knowledge or maneuvering as nearly anyone can operate the machine. Versatility Dry pressing and steam bursts are available to provide a selection of options to handle more tough fabrics. Capability The built-in water reservoir has a large opening to make filling easier. The unit allows variable temperature from 100 to 210 degrees to handle a variety of fabrics. Material Range The Speedy Press can press many types of fabrics including pants, shirts, sheets, blankets, linens and much more. Pyle is a brand known for its digital controls and the PSTMP95 tabletop steam press is yet another example of their abilities. The Pyle steam press allows you to adjust temperature and other settings right from the digital control panel for accurate and durable operation. On the control panel, there are also LED indicator lights along with multiple dry press and steam settings to provide full manipulation of pressing situations. The Pyle PSTMP95 features a powerful steam burst function that removes the most stubborn wrinkles and creates firm creases in a variety of materials. The unit weighs 26 pounds, is 22 inches long and uses 1,350 watts of power to offer precise pressing. The large steam press surface is 9 times larger than a standard iron, but it can still be operated easily with just one hand. The pressing surface is also stick-resistant to prevent burning or sticking of your fabrics. The accuracy of the unit’s temperature control allows you to use it effectively when steaming various materials including silk, rayon, nylon, wool and cotton. Unlike many steam press models, this one comes with a convenient removable water reservoir to make refilling easy. Digital Control The Pyle SPTMP95 is the best steam press for tech lovers as it allows you to adjust temperature and other settings from its digital control panel. Such controls allow for more accurate operation. Versatility The precision of temperature control allows you to achieve effective results with use of a variety of materials. Steam Burst The SPTMP95 comes with a steam burst function that releases an extra burst of steam with just the press of a button to help tackle more tough wrinkles and create defined creases. Automatic Shut-Off This safety feature helps to prevent hazards and burning of fabrics. Non-Stick Surface The non-stick press surface protects your items from burning. Speed The unit warms up for use in just five minutes. Water Reservoir The removable water reservoir makes filling much easier compared to other models. The 10-ounce tank slides out easily and also features a funnel for mess-proof refills. Press Cover It comes with a washable and removable steam press cover. In order to get the best experience of your steam press machine, you need to have control over heat and other conditions. Having a full user interface is important to customize settings to make sure you don’t damage your fabrics. Digital controls are best as they allow more precise control over temperature and steam settings. The frequency and intensity with which you use your steam iron press will determine the power that you need. The best steam press iron will have a higher wattage that will allow you to work more efficiently as you can produce heat much faster. A pressure of 100 pounds can easily be achieved with the best steam press machines. 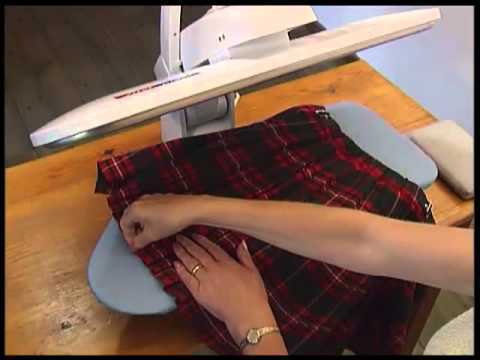 One of the main benefits of an iron press machine is the fact that it almost instantly smooths even large garments. These machines work well when you need to press a large volume of clothes at once. Because of their use in this way, the best iron press should be able to heat up quickly. A standard fabric steam press will likely take up more space compared to many other pressing devices, and a commercial steam press will be even larger. Even though you likely want to save space, it may be acceptable to use a larger machine if it means your needs are met. Most shirt ironing machines will come with safety features, so make sure any model you have in mind follows suit with those in steam press reviews. The most important safety feature is automatic shut-off. This turns the machine off in the event it’s left open or closed for too long. A large plate size will allow you to accommodate more items and larger pieces. A good-sized pressing plate is important for handling larger shirts or sheets, but anything too big will affect the total size of the unit. You should look for a nice balance between plate size and the size of the whole machine. The pressing plate on your machine should be able to reach the necessary heat level for your fabrics without posing a risk for sticking or burning. The best iron press for clothes should feature plates covered with a non-stick coating to utilize the high temperature without scorching. You may prefer to use dry heat when flattening your clothes, but steam can help set the shape to keep longer. Steam ports allow steam to be applied evenly across your garments, and presses with many steam ports allow you to steam more effectively. The best ironing press isn’t always the one with the most features. The best machine is one that offers many functions that serve a real purpose while still being easy for the average user to master. Find a machine that is simple to use even with added functions. A good water tank will offer a large size, be easy to fill and will also be removable for easy cleaning. You may find the best steam press for shirts when it comes to power and efficiency, but it still loses a mark if you can’t produce easy refills. Making the purchase for the best press iron will enhance your ironing and clothes tending significantly, and you will find yourself spending much less time and exerting much less effort pressing clothes. Because of the benefits these machines provide, you must take the time to carefully consider which model is best for you. What is the best steam press? Narrowing down models you’ve been considering will not be easy. If you want to get the best steam press for your specific circumstances, you’ll need to do extensive research on the models available. You can start by examining the best ironing press reviews to get a grasp of the most important features of each device. If an ironing press review isn’t enough, you may want to go view some models in the retail store. Even if you don’t walk out with the model you want, you may also be able to buy steam press accessories to come with a machine you order. Either way, you should wait no longer to go out and purchase a steam press to get ironing chores done much faster and make your life easier.